Ahn Hyun-mo, a former SBS reporter, is now actively working as an interpreter. Ahn does simultaneous interpretation for not only the entertainment industry, but also political events. On the 21st last month, she did a live interpretation for the ‘2018 Billboard Music Awards’. On June 12th (KST), which was the day North Korea and United States’ summit took place, Ahn appeared on the SBS show ‘2018 US and North Korea Summit – Drawing the Peace’. 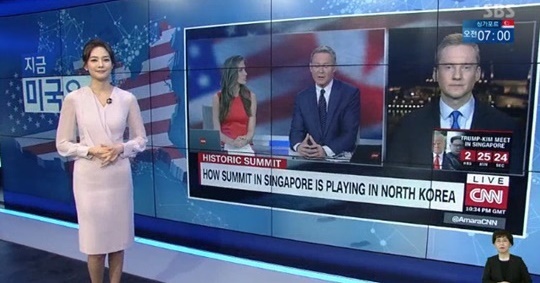 During the show, Ahn Hyun-mo did a live translation of CNN international correspondent Will Ripley’s report. During the show, Ahn’s name was ranked #1 on the hot search list. After the show aired, she posted her picture in the studio on Instagram. Rhymer Kim, music label Brandnew Music’s CEO and Ahn’s husband, re-posted the photo of his wife and wrote, “historical moment and best interpretation in history”. Ahn Hyun-mo graduated from Daewon Foreign Language High School and got her bachelor’s degree in Linguistics from Seoul National University. She then got her master’s degree from Hankuk University of Foreign Studies’ Graduate School of Interpretation and Translation. Since leaving SBS in 2016 where she worked as a reporter, Ahn has been working as a freelance interpreter and MC. Also, she got married to producer Rhymer Kim on September 30th last year.